To prepare the apple pumpkin dessert, cut around the top of the pumpkin, remove the lid, and clean out the seeds. Fill the pumpkin with apples. The fuller you fill the pumpkin, the tastier it will be. Add cinnamon and sugar to taste. You could certainly use very little sugar and the recipe would be more of a main course, but for a dessert, add a lot! You can mix the sugar and cinnamon with the apples before or after adding them to the pumpkin. 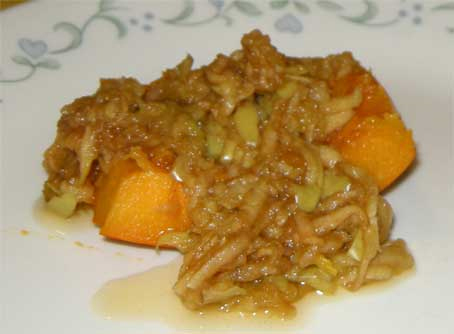 As the pumpkin cooks, the sugar will mix with the apple and pumpkin juices and become delicious syrup. Replace the pumpkin’s natural lid and put the pumpkin in a cake pan or on a cookie sheet and bake at 350 for 30-60 minutes, or until done. 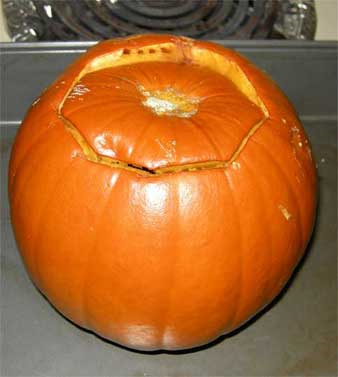 Be aware that the pumpkin’s shell will become very soft, and when you check it, it is very easy to make the syrup leak, so it is important that the pumpkin has something under it to support it. If the syrup does leak, you will probably be dealing with burnt sugar on the pan and on the pumpkin shell, but this will not affect the delicious result awaiting you. This recipe is sure to make a pumpkin eater out of even the pickiest little Peters. I think I just didn’t add enough sugar (about ½ cup). Our attempt was delicious, but not the way I remembered eating it as a kid. So if your kids don’t like it, try again, and add sugar, because done right, this recipe is simply divine! Vanilla ice cream on the side is a nice touch. Enjoy!